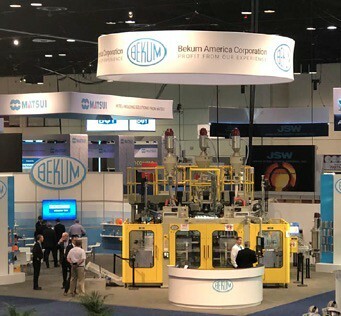 Blow molding machines built by the Bekum America Corporation manufacture and produce many unlikely products and containers for a wide variety of industries including ag chem, apparel, automotive, canisters, dairy, food and beverage, household products, industrial packaging, lubricants, medical, personal care and technical parts. These machines have been built in mid-Michigan since 1979. Do you know how many different skilled trade careers are necessary to produce these everyday products? Electricians, welders, machine assemblers, machinists, field service technicians and mechatronics professionals all play a part in creating the containers and products. This wide array of skilled trades required for the work we do is just one example of the many companies in our region that rely on skilled trades people. Not only do we need talented professionals to fill these positions, we need skilled trade talent across our region more and more each day. Now more than ever, it’s important for students to know about the career options they have in fields that don’t require a college degree. We should begin encouraging students as early as grade school to explore passions that aren’t tied to a traditional college education. At Bekum, a job plus education equals a career. Unlike a two- or four-year college degree, our education program is free for those pursuing an apprenticeship at Bekum. We look for graduating high school seniors with a 3.0 minimum GPA first and foremost. You can learn more about Bekum’s apprenticeship program here: https://www.youtube.com/watch?v=jMvx25RZxqE&feature=youtube. For a look at how some of our products are made, watch our video here: https://www.youtube.com/watch?v=xdKh_RWmodo.